The planet Venus passed in front of the sun early on the morning of Wednesday 6th June, between five and six o’clock. It was first witnessed in Lancashire, on November 24th, 1639. The next one won’t happen till 2117; the last one was in 1882. It’s effectively an eclipse, akin to when the moon goes across the sun, and requires the Earth, Venus and the sun to be in close alignment. 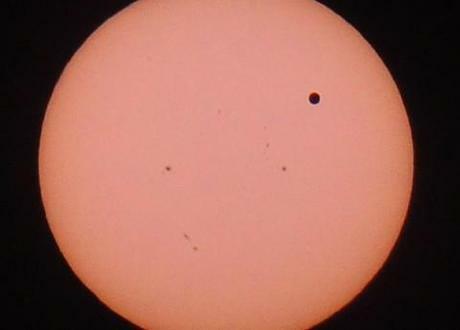 Venus appears as a tiny black dot., and crossed for six and half hours Venus is the second closest planet to the sun. Because the sun is too bright to look at, the Hubble telescope used the moon as a mirror, reported The Daily Mail. People watched it (through sunglasses) across the globe – and also on a Google+ Hangout, led by scientists and astronomers, reported Mashable. “It might be said that the best reason to watch a Transit of Venus is history. It can carry you back to a different place and time: Tahiti, 1769, when much of Earth was still a mystery and the eye at the telescope belonged to a great explorer,” said Dr Tony Phillips, a Nasa scientist, quoted on The Times. It’s a “sort of celestial Jubilee event,” said David Robson in The Express. Make a note of the next one for your grandchildren – “It’s some time in December.” Or “why bother?” The fact is, the world is probably going to end on the 2st December this year. The Mayans said it would – at 11.11 am. Fundamentalist Christians think that 6th June is “the final prelude to the apocalypse.” Luckily, though, we “got the Jubilee over” before the end.